This 15 Niche Business Logo Designs Bundle is a collection of the professional ready-made logotypes designed by MotoCMS. This is extremely useful for freelancers and web design agencies that work with clients and need the professionally crafted logo designs for their web projects. 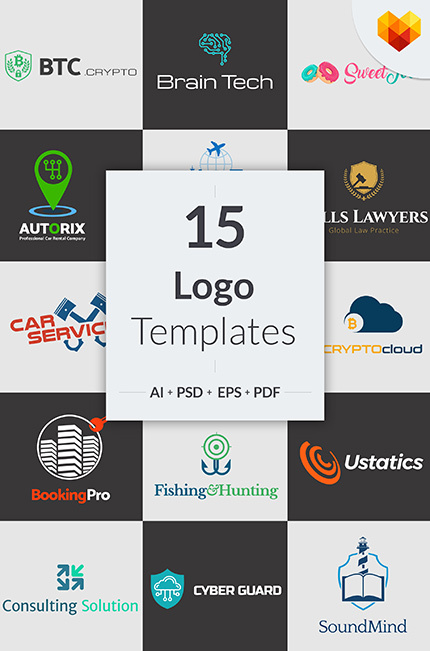 All the logo templates that are included into this bundle are available in all popular formats like AI, SVG, EPS, JPG and PSD. All of them are also intended to look amazing on all devices and displays, as well as in print media. Any simple logo design that you choose from this bundle is intended to become recognizable and easy-to-recollect presentation to the brands. Every logo design that is included into the bundle is compatible with both Adobe Illustrator and Photoshop, so these are rather easy to edit. Use the premium logo designs bundle to bring a versatile presentation to every project that you launch.